That I was mesmerized by the variety of produce on my first visit to our neighborhood veggie market is an understatement. We moved to San Francisco in the mid-90s, well after the folks along the coasts had revived the local farmers’ market and a broader market for fresh seasonal produce had emerged. But the revolution hadn’t quite reached the Salt Lake City masses by the time we left Utah and I simply didn’t know that such a variety of fruits and vegetables was known to so many people and that city folk cook as many of them as they do. I was embarrassed. My more experienced eyes have gotten better at scanning the bushy beds of red and green leaf lettuces, chicories and tender greens. I’ve grown increasingly enamored of the contrasts in texture and color I find throughout the market. I’m relieved to know the differences in tastes among the mustards, collards and cresses. In the midst of those radicchio heads, rainbow chard and kale lay dark, stick-like interlopers. Dirty, brittle burdock roots are inexplicably nestled among big, dramatic leaves. The shape of the tender root leaves a mean impression – slender, bark-y, impossibly straight and remarkably long – but these are not wooded sticks or twigs. A member of the daisy family and related to dandelion and chicory, the burdock in my market is essentially nothing more than the tap root of a biennial weed. Northern Asians and Europeans have been eating it for ages and it seems, to my surprise, to be fairly ubiquitous. The Japanese, who call it gobo, seem to like it a lot – they stew it, stir fry it, make sushi and medicinal teas from it. It’s put to good use in stews in England and France, though less frequently these days. No doubt my pioneer ancestors ate it or made medicines from it wherever they found it along the trail westward. A quick search of the cookbooks on my kitchen shelf didn’t offer much on this pedestrian old-world vegetable, but a recent Google search for burdock recipes produced an astounding 53,900 hits. Where have I been? That it is found in most places in the world confirms the genius of burdock’s design. The seed pods stick to everything, especially animal fur, and germinate easily. The name speaks to the seed pods, or burs, of the burdock plant that very likely inspired George de Mestral, the inventor of Velcro® who hatched his remarkable idea after a walk in the field and an evening spent picking burs off his clothes and out of his dog’s coat – a happy accident and a stroke of great luck. The aisles of the produce market are narrow and on a Sunday afternoon, full of shoppers. Most of us carry plastic grocery store hand baskets. With plenty of bumping and nudging, you learn to say “sorry” and “excuse me” with a pained smile. When I got to the burdock I was reminded of its astonishing length. I knew movement through the aisles would be tricky with a long pointed stick resting on the rim of the basket and shooting outward a good two feet beyond the “bubble” around me and my stuff. That I didn’t think to wait to grab it until I was ready to check-out probably says more than I care to admit about my social skills. I recommend cutting the roots to manageable lengths before scrubbing them. Having a three foot long spring-loaded pole in the hand makes for some tough cleaning over the sink (the experienced clerk at the market cut my specimen in half for me so I could manage it in on my walk home). I left the skin on half of the root and used my vegetable peeler on the other half. I chopped the unpeeled burdock into chunky rounds and shaved the peeled burdock into long ribbons. Exposed burdock oxidizes quickly. This is a vegetable for which the acidic water bath was created. Boiling seemed the most straight forward preparation and a pot of salted water makes for easy clean up. Raw, it doesn’t taste like much. But the fragrance of the freshly cut and peeled tuber reminds me of other pungent roots like parsnips and rutabagas. I gave my sample a simple boil because I wanted to get to the foundational flavors of the food. The cooking liquid has traditionally been poured off and saved for use as a tonic. But I salted the water to season the burdock as it cooked and instead of saving it for soup, I foolishly tossed it. The taste of simply cooked burdock is mild and reminiscent of its artichoke cousin. I like the name. And I prefer the sound of burdock to gobo, though the latter better places it in its context – a produce market in the middle of a mostly Asian commercial district in San Francisco. Burdock sounds funny and seems to beg for naughty wordplay. This is a plant known by many names – beggar’s buttons (inspired by the clinging pods? ); love leaves (a reference to the heart-shaped leaves at the plant’s base); or, my favorite happy major! I mostly like what burdock has come to represent in my evolving appreciation of the bounty of fresh markets and my budding fascination with the simplest of time-tested foods. This is a food I’ll return to often. Bring water to a boil and add salt. 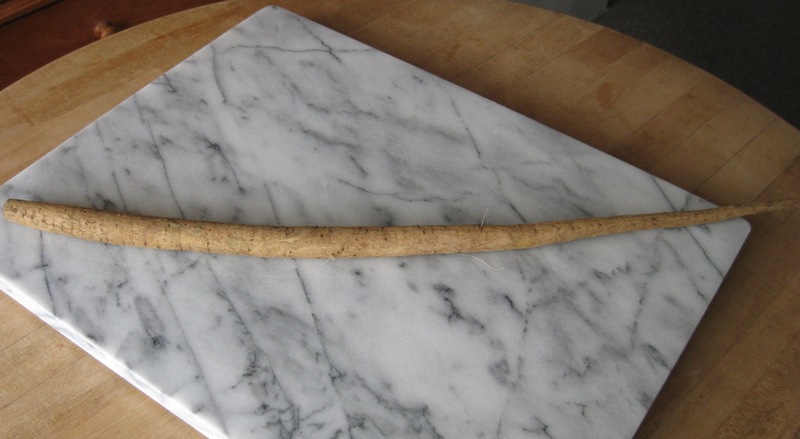 Once water comes to a boil, cut burdock into lengths, and peel with a vegetable peeler. Once clean, use the peeler to make long ribbons of burdock and add them to the boiling water quickly (burdock oxidizes like artichoke and must be cooked shortly after peeling or it will blacken). 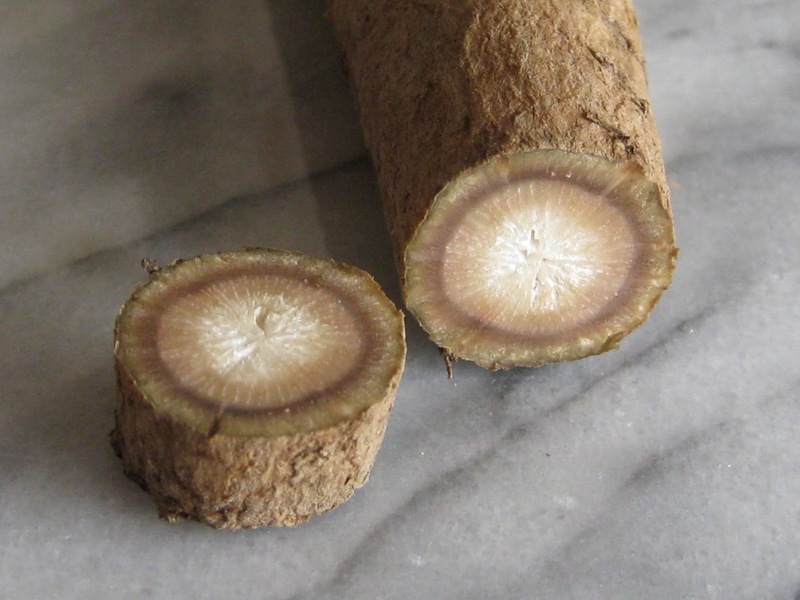 Boil burdock until tender, approximately 15 – 20 minutes. Remove from heat and drain. In a bowl, mix the soy sauce, rice vinegar and sesame oil. Add burdock noodles and toss. Plate and finish with fresh cracked black pepper.